Antipope; born at Aragon about 1334; elected Sept. 28, 1394; died at Peñiscola June 1 (according to some, Nov. 29), 1424. This "unfrocked and spurious pope," as he was termed by the Council of Constance which deposed him (1415), caused much suffering to the Jews. Zealous for their conversion, he shrank from no measures to bring about this result. While he was still a cardinal he forced ShemṬob ben Isaac Shaprut to appear at Pamplona before an assembly of bishops and high ecclesiastics in order to debate the question of original sin and salvation. This zeal for conversion and controversy was encouraged by the baptized Jew, the unfrocked rabbi Salomon Levi Burgos (called by his Christian name Pablo de Santa Maria), and Benedict's physician, Joshua Lorqui, whose Christian name was Geronimo de Santa Fé. They persuaded their master that they were able to demonstrate from the Bible and the Talmud that the Messiah had already come in the person of Jesus. Benedict, who had perjured himself in order to save his tiara, hoped to atone for his sin before Christendom by a splendid deed, such as the conversion of the Jews en masse. He therefore summoned the Jewish notables to a controversy at Tortosa. Twenty-two of the chief Aragonese Jews answered the summons, and assembled at Tortosa Feb. 6, 1413. At first Benedict treated them with kindness; but seeing, in the course of the debates, that he could not hope to convert them by persuasion, he threw off his mask and vented his wrath on the Talmud. When all means of converting them were exhausted without bringing about the desired results, he dismissed them in anger. The consequence of this unprecedented controversy, which extended over a year and nine months (Feb. 6, 1413, to Nov. 12, 1414), was the issuance of an anti-Jewish bull containing eleven clauses. By the terms of this bull the Jews were prohibited from studying the Talmud and Talmudical literature. All copies of the Talmud were confiscated. The communities were forbidden to build more than one synagogue poorly equipped. The Jews were not allowed to eat, bathe, or trade with Christians. They were not to hold any public office; not to follow any handicrafts, nor even to practise medicine. They were compelled to wear a red or a yellow badge, and three times a year, during Advent, at Easter, and in the summer, they were to attend Christian sermons. 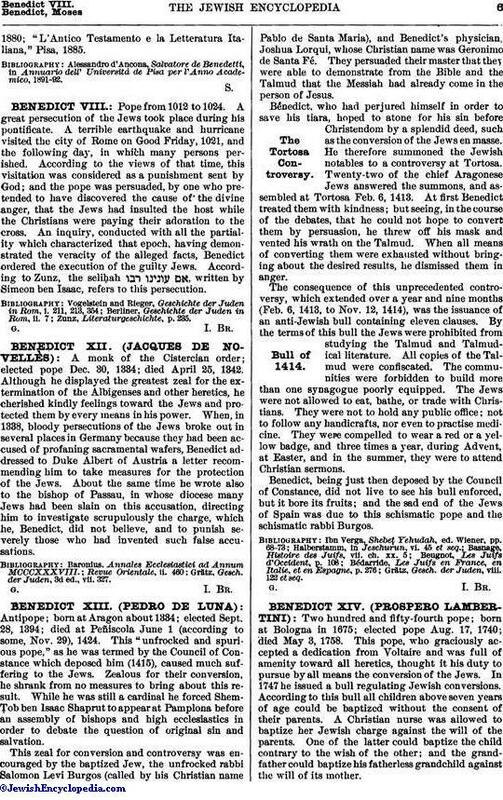 Benedict, being just then deposed by the Council of Constance, did not live to see his bull enforced, but it bore its fruits; and the sad end of the Jews of Spain was due to this schismatic pope and the schismatic rabbi Burgos. Grätz, Gesch. der Juden, viii. 122 et seq.